1. As trailed in a previous issue of HKN, Cobra Company has now released their full interior detail set for the Testors H-43 Huskie. This also includes white metal flight controls and a photo-etch detail sheet Some exterior update parts to make an HH-43F are also included. To see pictures and a glowing review of this set, point your browser at IPMS Albuquerque. The set costs $39.95 plus P&H and can be ordered from Cobra Company ONLY. This is a limited edition of 200 sets and will not be sold or distributed through stores or hobby shops. COBRA Company, 3313 Pathway Ct, Falls Church, VA 22042 (703)204-9412/phone/fax. Visa - Mastercard accepted. Chris Miller of Cobra Co. explains: "They jumped the gun on that one. The shops and distributors have been pressing us to know what we are working on, so we had given them an idea. Not everything works out though, and the Huskie set is one of those things. This set turned out to be so extensive that we couldn't afford to sell it to the discounters. Those who were expecting to get it have been sent letters advising them that it will not be distributed. We will make enough sets to use up the photo-etch and white metal that we ordered. They will be sold first come, first serve. When gone, that's it." 2. Thanks to Kyrre Ingebrethsen I have now obtained a set of the Norwegian Bell 412SP Arapaho Decals from Romerike Hobbysenter, Stromsveien 102, N-2010 Strommen, Norway. On the sheet labelled "2C Arapaho" you get three each of the black serials "139, 142, 145, 147, 148, & 149", twelve low-vis roundels, and two left- and two-right handed white titles reading "339 SKVADRON BARDUFOSS", as shown on the example in the Arapaho gallery at IPMS Norway. I also got another little sheet labelled "2B Sea King update" which has two black titles "LUFTFORSVARET", two large serials "322", plus a smaller "322" and "074". These would apply to Mk.43 Sea Kings after about 1995. There's pictures showing Mk.43's wearing these new titles at the IPMS Norway website also. Both sheets say they are "Produced by DMC Decals, Made in Denmark"
3. Masterkit will re-release the ex KP Mi-17 Hip, and also a Wessex which is presumably the Frog one. Boxart pictures are at Matlan's review of the Nuremburg Toy Fair. 4. Also at Matlan you can see built-up examples of Revell's new 1:32 Klu Alouette II and 1:72 Agusta A-109. The Alouette picture shows the example in the Militaire Luchtvaart Museum at Soesterberg, Netherlands. 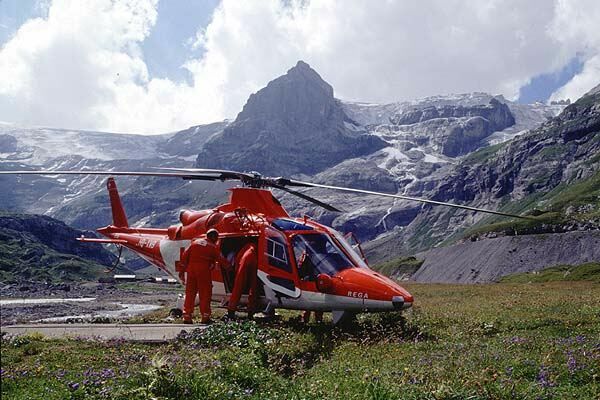 There are general and detail pictures of the Swiss Air-Rescue A-109 at REGA, and also here. 5. The Interavia H-25/HUP-2 announced in SAMI Feb-99 comes in 2 boxings; US and French/Canadian. Linden Hill have some on the way. Retail should be about 7 pounds. Guy Holroyd says "my pals in Moscow tell me Interavia's quality is "better than Amodel". Doesn't help much, does it?" Interavia will probably also be available from Tushino Aviapress. 6. The next edition of World Air Power Journal (#37, Summer '99) will have the Mi-24 Hind as the "Feature Aircraft". I think I am right in saying that this is the first time a helicopter has been top of the bill in WAPJ. Should be something to look forward to.